I was going to post a recipe today, but sole fish cakes can take a “back-burner” for now. (Get it? Sole fish cakes, back burner?) No? Anyway, moving right along as there is no time for my cheesy joke fest this evening. I was at the gym checking my form as I executed bent over back rows. Suddenly, a wave of self-criticism came over me. I began to do something I swore off doing on Valentine’s Day. I began to insult my body. As I pulled the weight up, I was thinking, when will my back and arms bulk up? Why is this taking so long? I’m eating right. I’m weight training. Why is my upper body so slight? Why are my thighs still so wide, although I am hitting the treadmill so hard? Well, needless to say, I broke my promise to self to always build myself up and all that self-loathing left me in a bit of a foul mood. With sweat dripping down my brow after a hard run on the dreadmill, I went to the washroom and splashed cold water on my face. Looking in the mirror, I said, okay, this needs to stop…now. My goals are close and I am getting stronger. I am getting healthier. The little mantra lifted me slightly from my funk, but as I walked home from the gym, I still felt a bit on the blah side of town. After a meal of lean beef stir fry with bok choy and brown rice, I settled on the couch to open my WordPress account. I always go to Reader first, because I love reading other blogs I follow. I find this both uplifting and inspiring. Inspiration was definitely on my agenda today. First I read Sara’s blog. 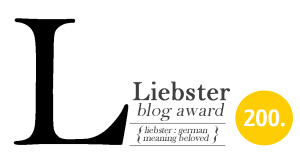 She had been nominated for the Liebster Award. This award recognizes and supports those who are new to the blogging community. I was happy for Sara, and not surprised as she has a fantastic blog. As I was scrolling down her page, I saw her nominees for the award. There it was in black and white… trextotigress. At first I thought, that name looks familiar. You know when you’re in that space of wrapping your head around things? Well, that’s where I still remained as I read my blog title. Then it dawned on me. Duh! That’s me! Needless to say, I was surprised and honored. Later, I read a ping back in my notifications. Again, dumbfounded and in that whole state of wrapping my head around things. 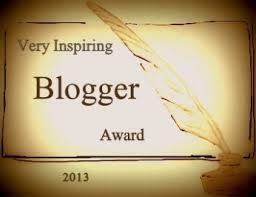 Lisa Traugott of this blog nominated me for Inspiring Blogger of the Year Award!! Hell yes, double exclamation point! These are fitness bloggers I both admire and follow. Awww. Thanks, Krys. It’s just great to be nominated. Thanks very much. I’m new to all of this, so I hope I do all the steps correctly. Lol. Congratulations on both or your awards, and for dismissing your negativity! ONWARD! Thanks so much. My negativity is a battle I try to dismiss everyday.